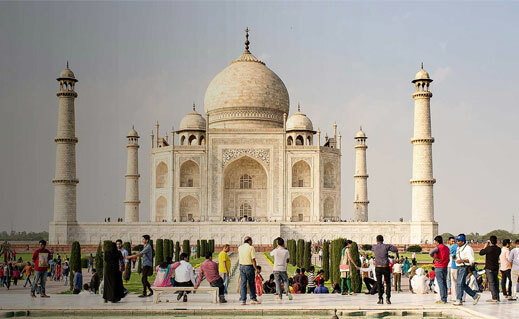 Taj Mahal is one of most famous tourist destination of world and located in Agra. Taj Mahal is the most famous monuments in Agra, India. Taj Mahal is a symbol of devotion and dedication of love. A monument Taj Mahal is in Agra built by Emperor Shah Jahan in memory of his wife Mumtaz Mahal. We offer special weekend tour package for Agra include major sightseeing Taj Mahal, Fatehpur Sikri and Agra fort. Taj Mahal is one of most famous tourist destination of world and located in Agra. Taj Mahal is the most famous monuments in Agra, India. Taj Mahal is a symbol of devotion and dedication of love. A monument Taj Mahal is in Agra built by Emperor Shah Jahan in memory of his wife Mumtaz Mahal. Arrival at Delhi Airport/Railway station and Traditional 'Welcome' at Airport. Meet with our representative in Delhi and drive to your Hotel in Delhi. Early morning after getting breakfast, drive for local sightseeing full day of New Delhi and get enjoy of visiting all of famous sightseeing inclue Raj Ghat, India Gate, Panaromic tour of President's House, Parliament and visit to Humayun's Tomb, Qutub Minar, Lotus Temple, Lakshminarayan Temple, Akshardham Temple. After getting local sightseeing transfer to hotel and Overnight stay after dinner in Delhi. Early morning after getting breakfast, check out from the Delhihotel for exploring amazing city of India known as Agra. Driver toward to Agra from Delhi by surface. After check in and some rest proceed for sightseeing tour of Agra whereby you will get to see the best of Mughal architecture such as the Taj Mahal, Agra is one of most famous and visiting destination of India which is known in world of its architecture . Agra city has many mugal era architecture include Agra Fort, Itmad-Ud-Daulah's Tomb, Bulund Darwaza, Jama Masjid and the tomb of famous Sufi saint Sheikh Salim Chisti. Taj Mahal is most famous monument India and one of seven wonder of world. Overnight stay in Agra. Amax Tours & Travels is one of most famous Delhi based travel agency which provides tempo traveller and tour package services. Copyright © Amax Tours & Travels. All rights reserved.